I’m told I’m a fast knitter. I might be, but If you really want to see fast knitting, you should go watch some version of this video. 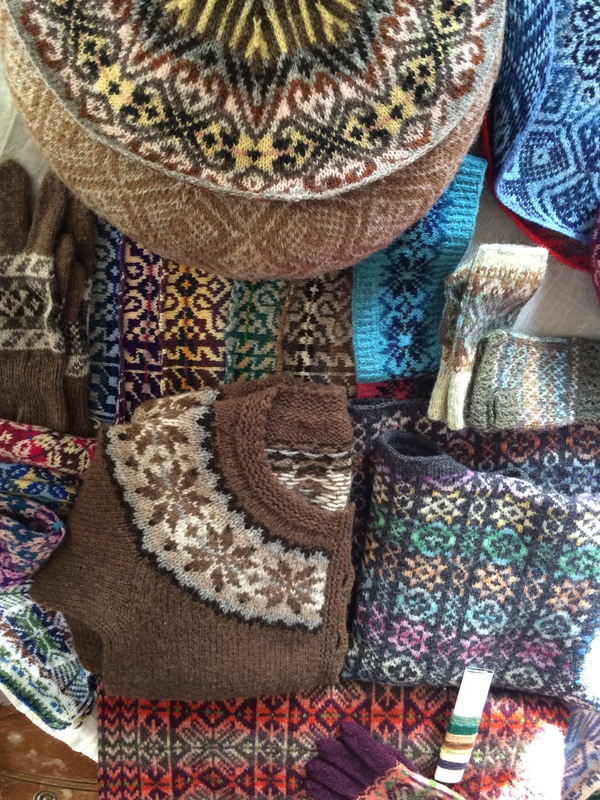 Hazel Tindall is not just the world’s fastest knitter but she is an amazing fair isle designer. As you can read here, she has been knitting fair isle all her life. During our trip to Shetland, we got a chance to visit with her. She was kind enough to bring samples of her knitting. She also had her Jamieson & Smith colourbox challenge piece with her and she let us all cut a piece of the neck and arm hole steels!! I couldn’t help myself. I asked her how long it took her to knit this vest. Her answer? “Well, I knit this at 6 min/row and there are 106 rows to the armhole” (actually it may have been 104 rows but that is just a rounding error). Let’s do the arithmetic, shall we? I’m sure my parents will be happy to hear that I can still flex my college education to do important math like this! Hazel was so gracious. She gave us some knitting tips, answered many of my insane questions (like, “what do you do in the winter when it’s dark outside all the time? do you knit like 12 hours a day!?!? (that would be a vest a day, btw)”, etc.). So much fun. 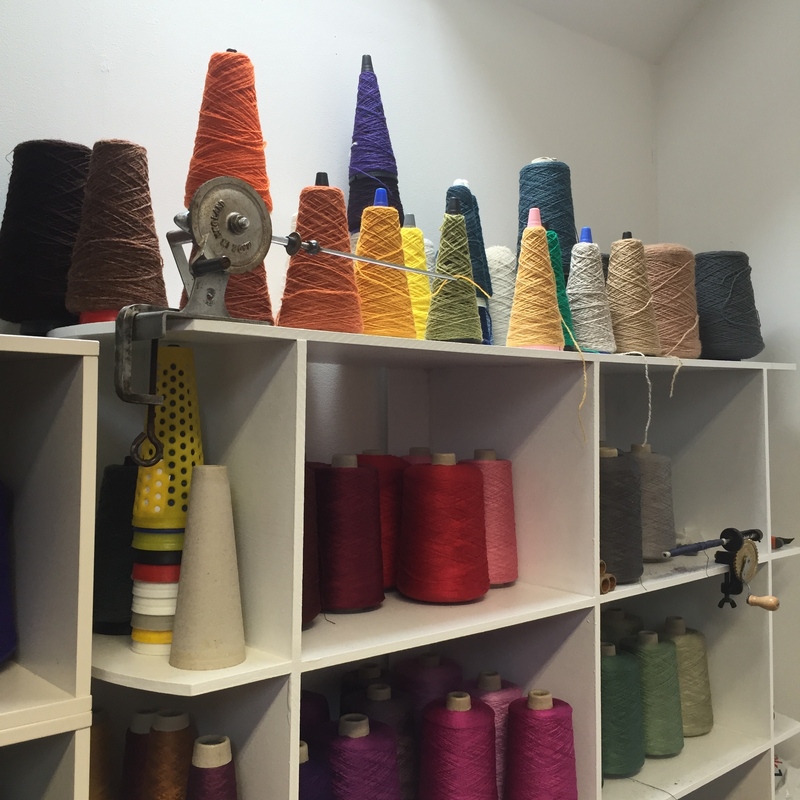 You may recognize the knitting we are cutting in Jamieson & Smith’s blog post about the Cunningburgh Show! Despite our scissor-work, the vest was a trophy winner. Congratulations, Hazel!! The samples were amazing. 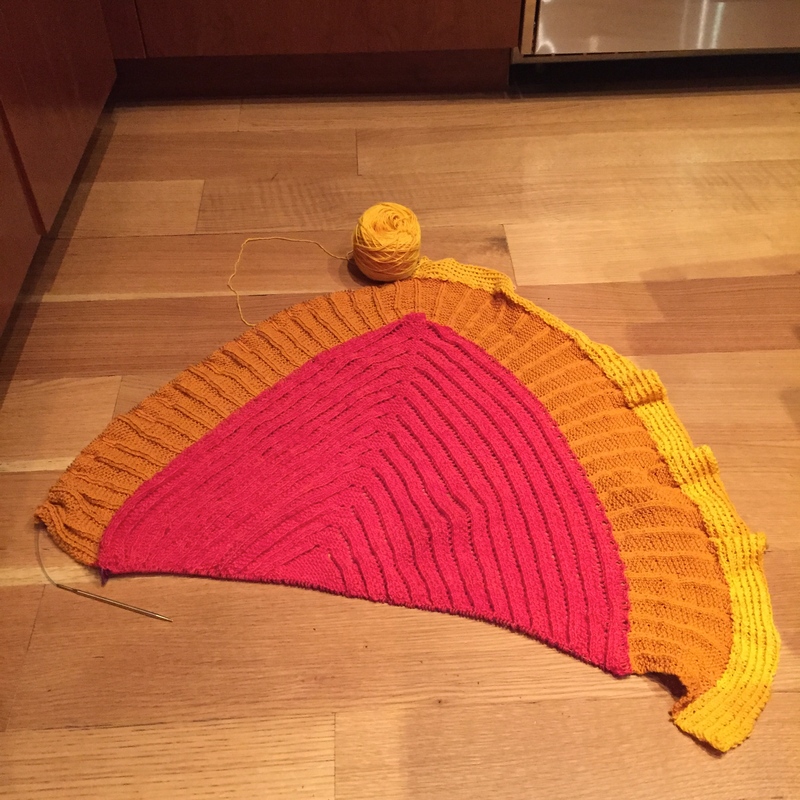 Knitting was, of course, fantastic — evenly tensioned (all you have to do is look at the reverse side of the knitting), use of color was beautiful, and there was just one wonderful thing after another. It’s the Hamnafield Cardigan. 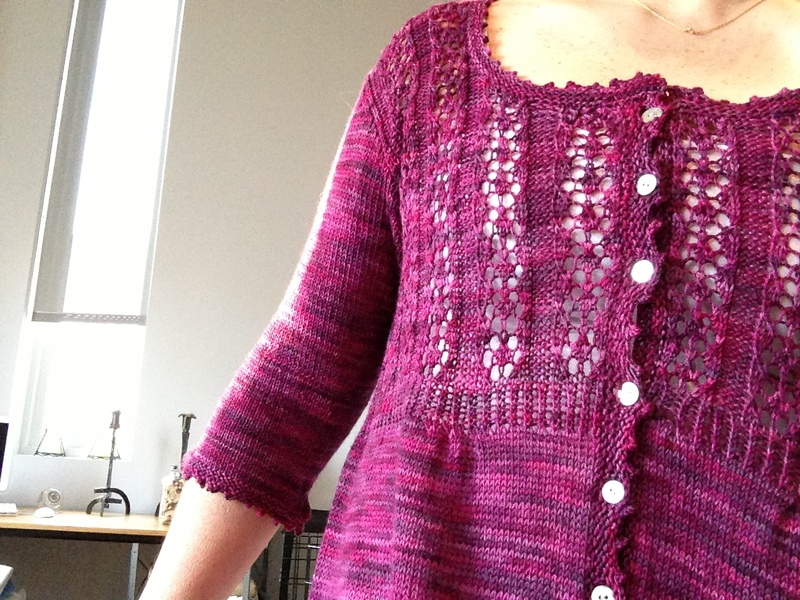 (The moorit cardigan in the bottom left corner in the photo above, with the color work yoke.) 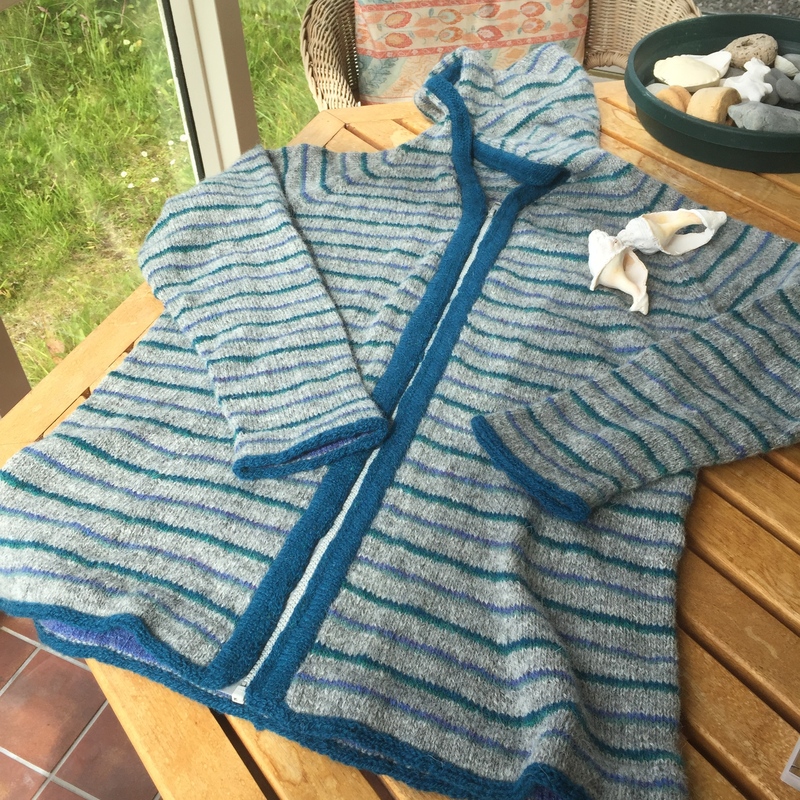 It’s the cardigan that Hazel designed and knitted for Shetland Wool Week last year — and the pattern has just come out. 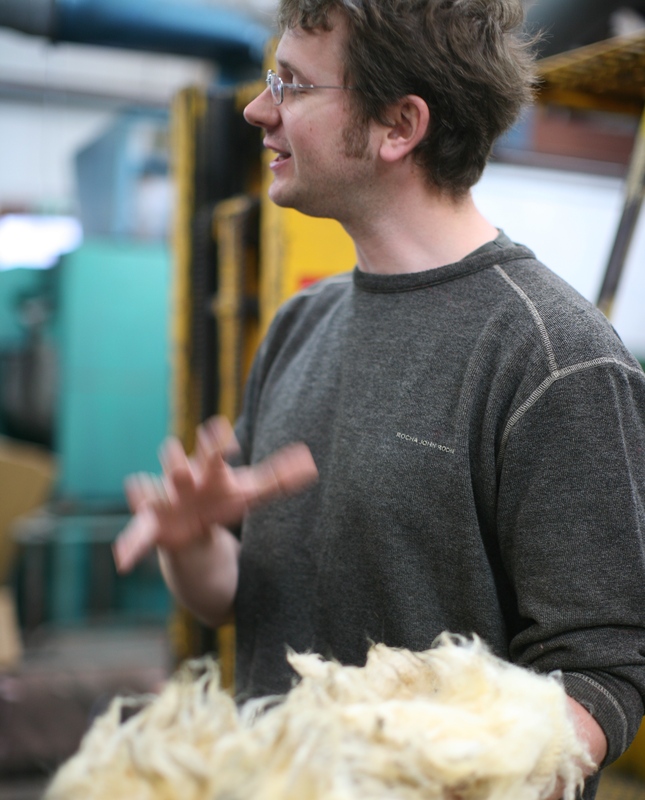 It is knit out of wool from sheep on Foula. This is how close I got to Foula. 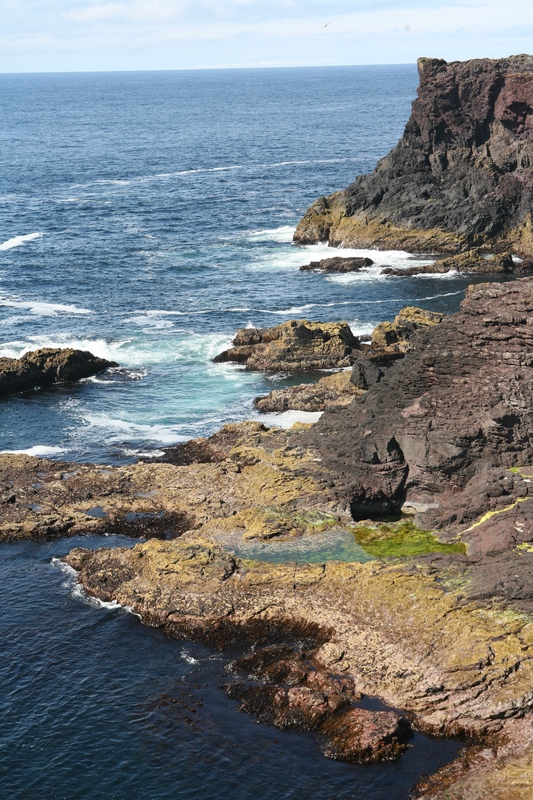 I know about Foula because I hiked as far as I could go to the ocean in Walls and I saw an island off the coast — and I looked at the map. I had put it on my “next time in Shetland, I would like to” list because it sounds like birding on the island would be pretty interesting. 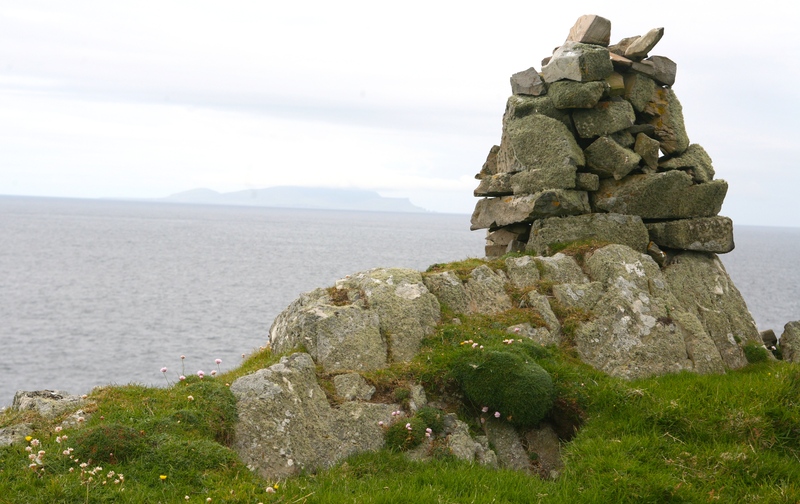 I also liked the description that I found on the Web about Foula: It is “one of Great Britain’s most remote permanently inhabited islands,” according to the modern version of Encyclopedia Brittanica (Wikipedia, I mean). 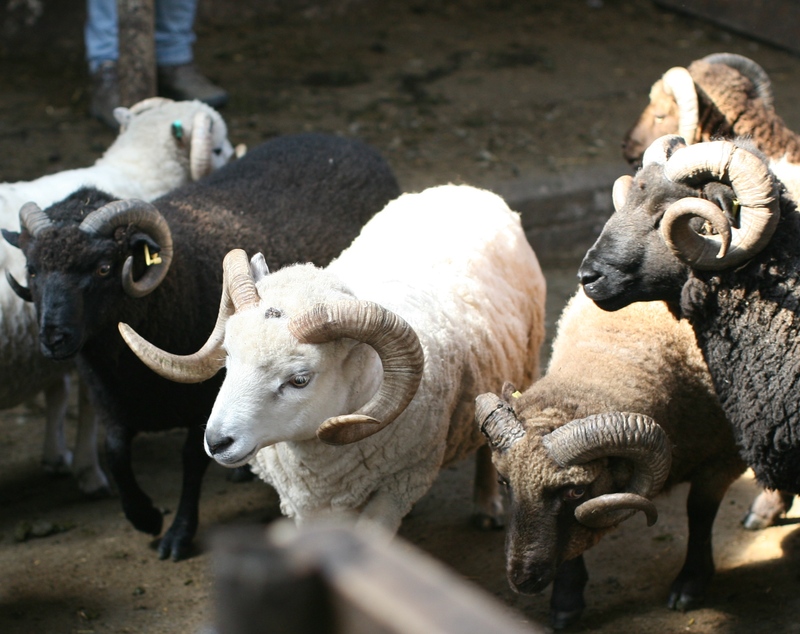 Of course, after speaking with Ronnie Eunson about natural colored sheep (and now that I know there’s YARN on that island) I doubly want to go. How could I have possibly not heard about this yarn? Clearly I am slacking in my yarn trolling duties. Remember that I said meeting the incredibly fiber artists and having access to the Internet was “killing” me? That’s right. It’s Yarn from Foula. 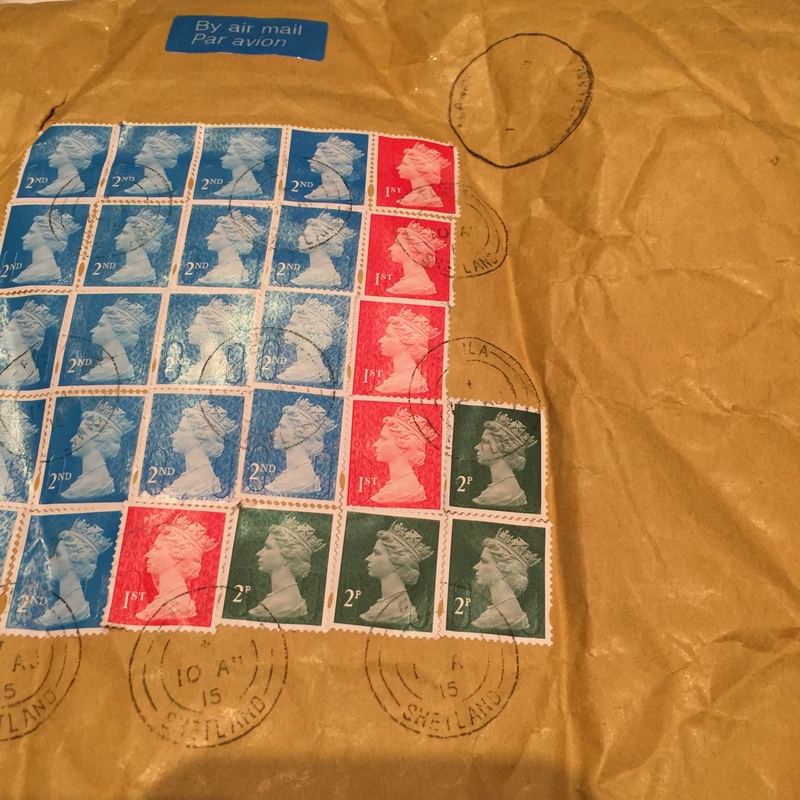 This package is from my “new person I want to meet”, Magnus Holbourn. You can find him online too at http://www.foulawool.co.uk. I have enough yarn to knit the Hamnafield Cardigan. I think I need a couple extra sets of arms — or try to catch Hazel in speed — with all the knitting I have planned for the fall. Hazel is a huge inspiration. So was Elizabeth Johnston, and more about what happened when I met her in the next post! With all the sheep walking about, was I tempted by their fleece or yarn? 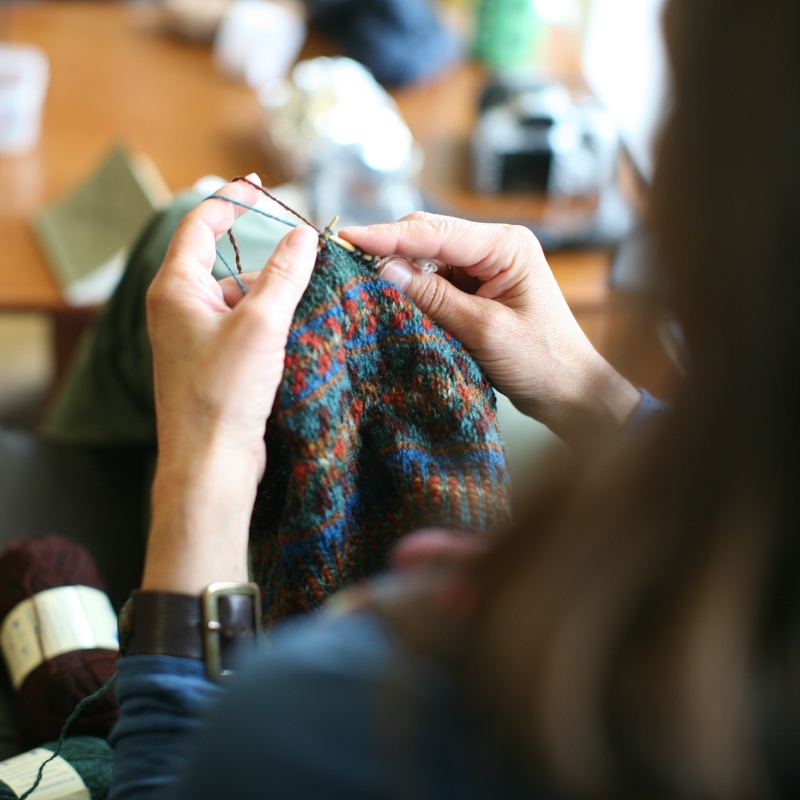 But traveling with 12 other knitters, who were all wearing beautiful handknits? Killer. Being connected via Internet during the trip (as bad as connections were), pretty bad. 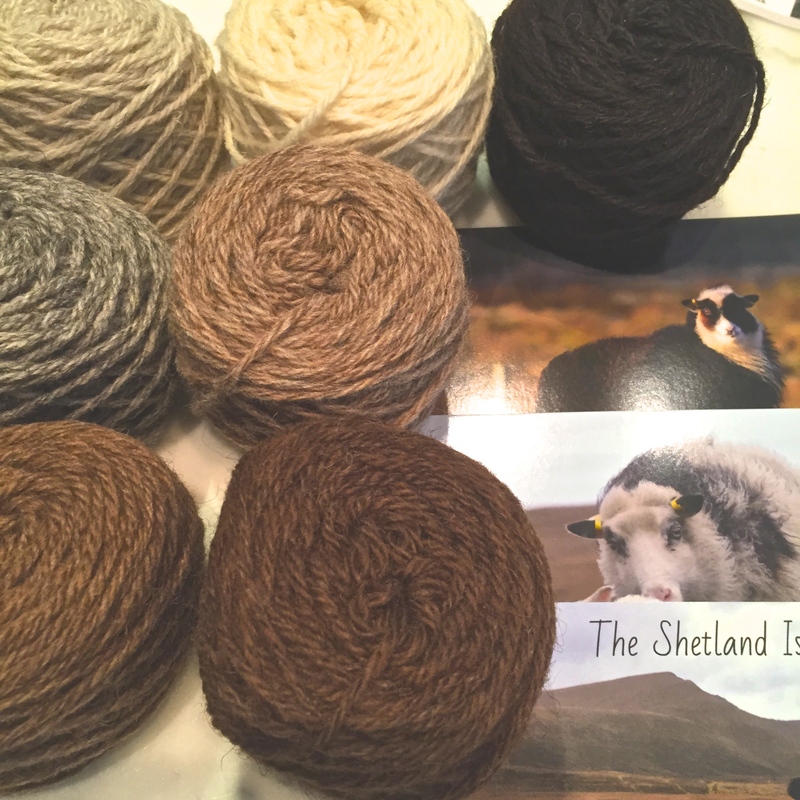 Meeting with incredible artists on Shetland? Even worse. 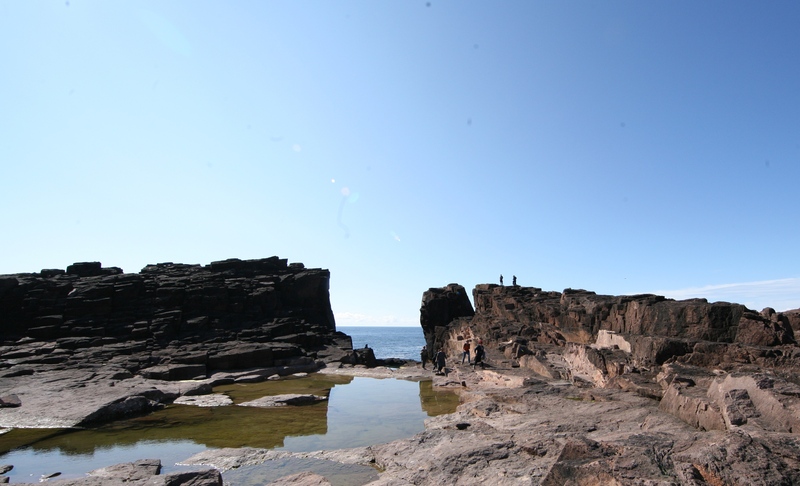 but after going to Northmavine (Eshaness), I was very glad that I did. I feel like I know exactly why Kate Davies chose these colors. Handknits from this collection was particularly popular. 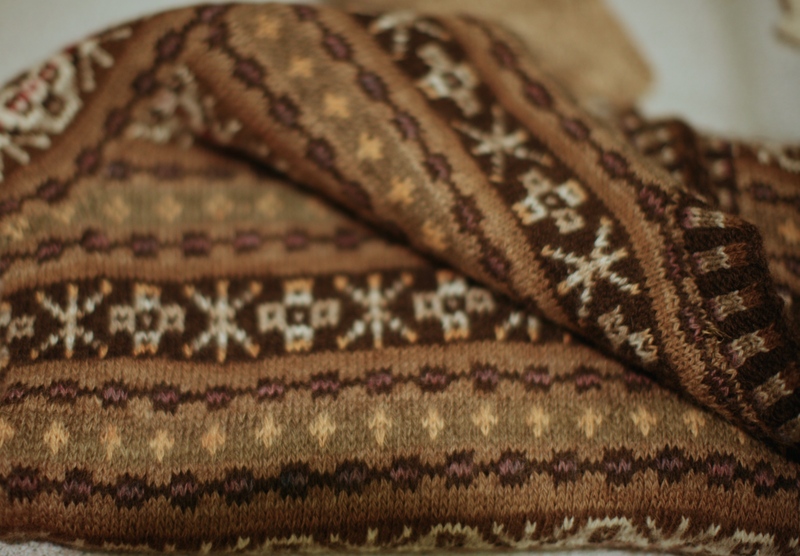 I also had the Northmavine Hap from this collection, knit out of all the natural colors of Shetland sheep represented by J&S Supreme Jumper Weight. I had made this slightly larger so I can wear it like a true hap shawl (wrapped around and tied in the back), and I wore this shawl quite a bit as well. ..along with perhaps almost everyone else on the trip. 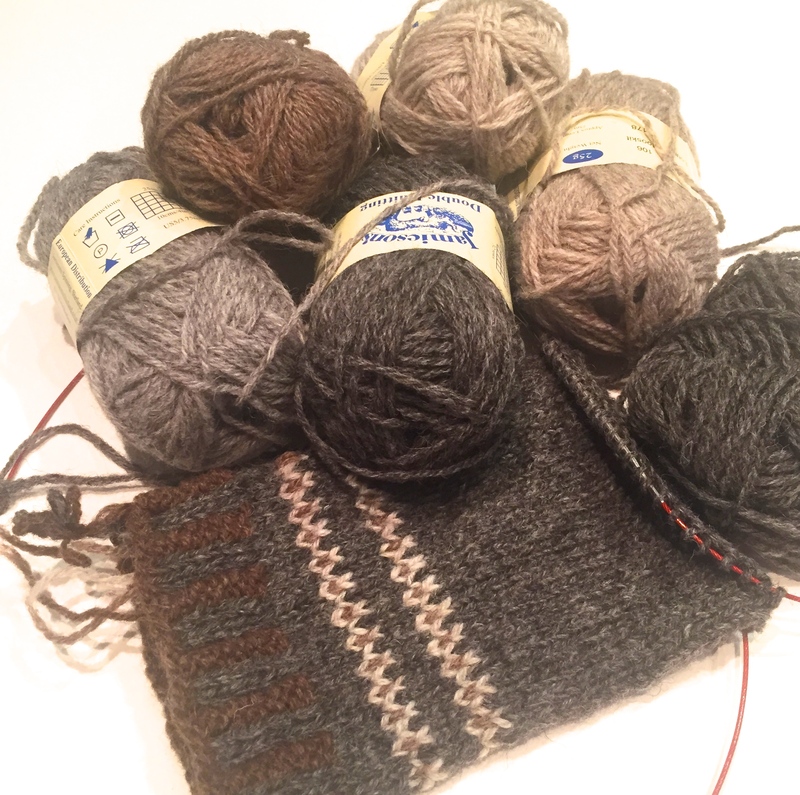 I’m not changing the colors on this sweater either…because well, puffins! We were traveling with Gudrun Durham (nee Johnston), so her designs were of course very well represented. 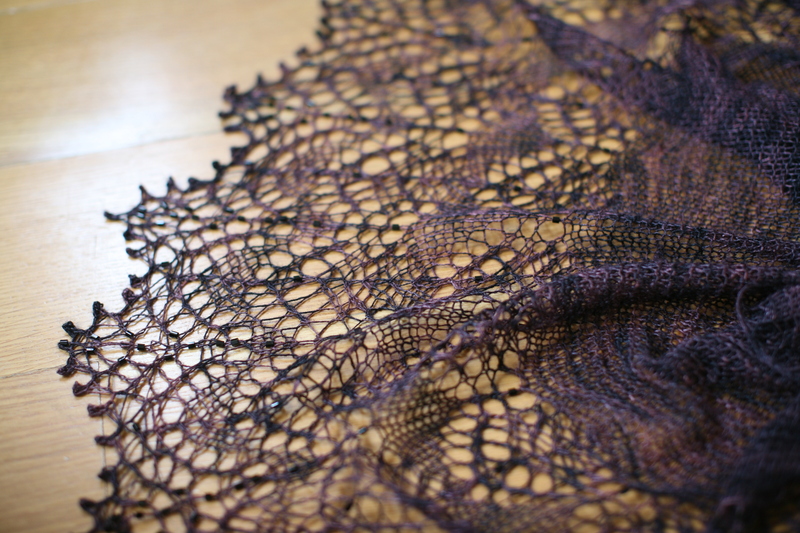 I had my absolute favorite shawl with me, her design, Flukra (now I know how to pronounce it — “fluck-ra”). I felt slightly weird that this shawl was knit out of merino/silk! 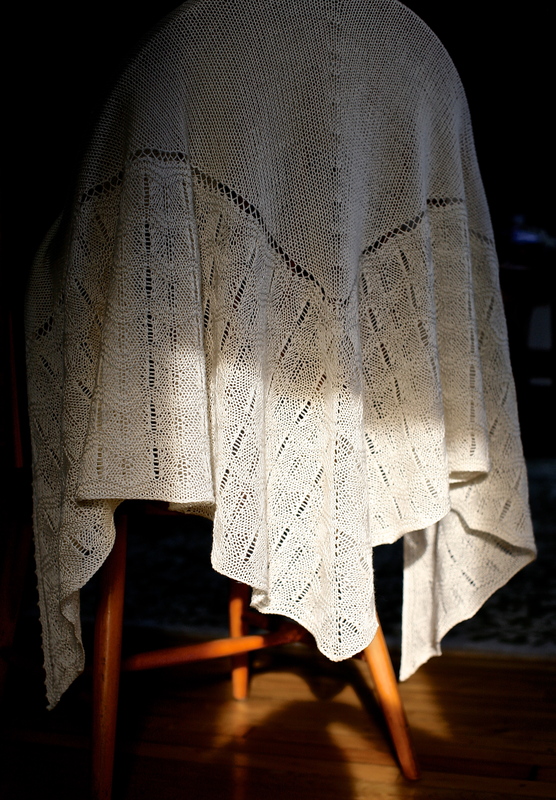 I will have to make this again in Shetland wool. and there were several Audrey in Unsts (which, mine is now gone and I have the yarn to knit another). 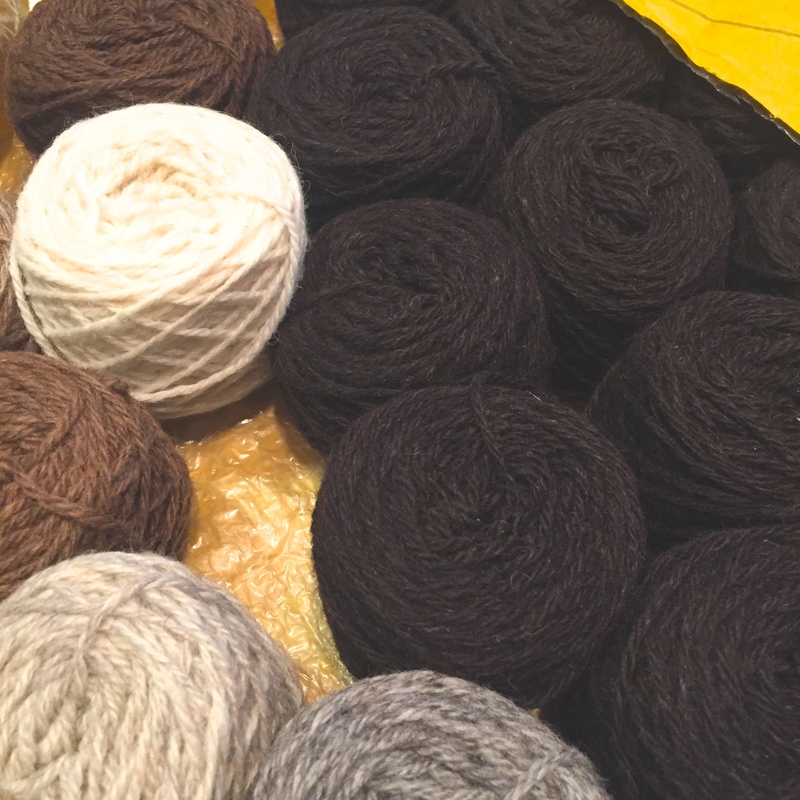 …and yarn to make Nikka Vord, my version in the same yarn as the pattern (Jamieson’s DK) but a combination of different natural sheep colors. See what happened? It wasn’t the sheep. That is, until Uradale. I was “chatting” with Deb Robson via the Internet. She knew I was in Shetland, and she was telling me a bit about her encounters with the Shetland Organics movement (Her trip to Shetland last year can be found on her blog here), of which Uradale is a participating croft. Then she told me that the Shetland Organics yarns are (and I quote her here very loosely, sorry Deb) one of her favorite yarns, not just from Shetland but globally. Then, of course, there was the dinner with Hazel Tindall. She brought along for us a suitcase full of her work. I am remiss in not having taken good photos of her beautiful sweaters, and pillows, and hats, but it’s because I was too busy listening to her talking about them. Well, of course, one sweater really caught my eye. So I asked about it. And I did something about it. But more about that next time! 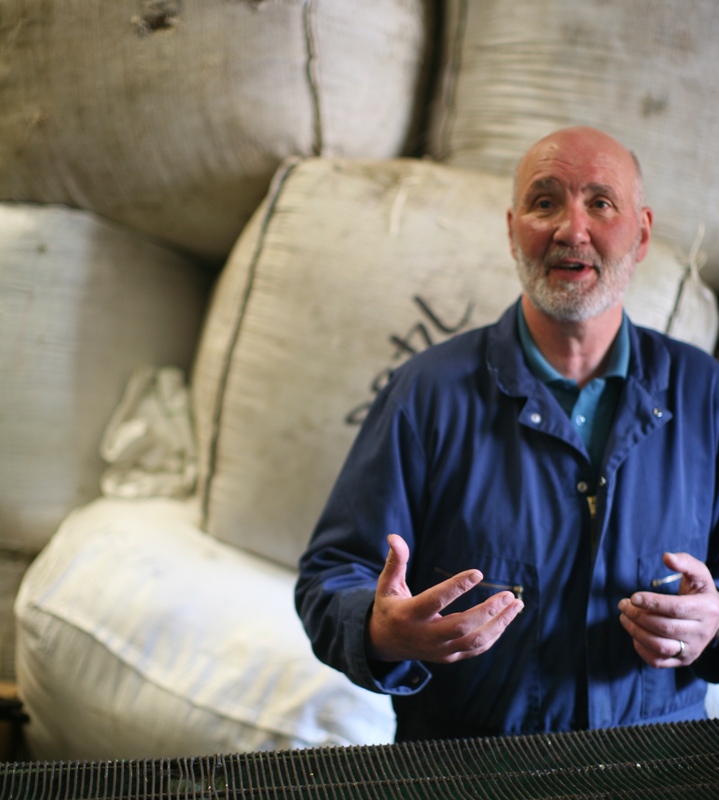 According to Ronnie Eunson of Uradale Farm and Gary at Jamieson’s, there are about 150,000-200,000 heads of sheep on Shetland, of which only about 50,000 are Shetland breed. It still outnumbers the human population of about 22,000! 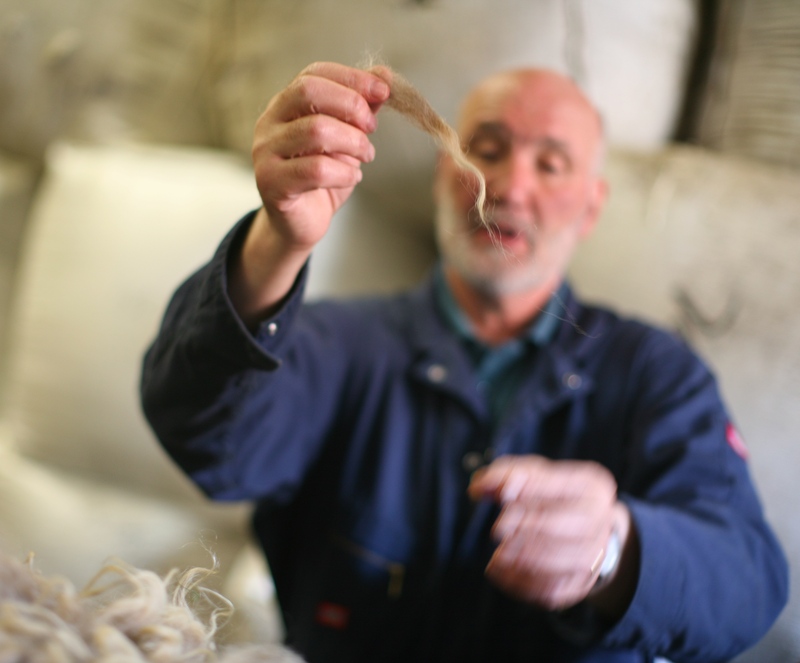 We think that white is the dominant color in sheep, but in fact, it’s the color that has been bred for and, again according to Ronnie, in a remote place like Foula, the dominant color is moorit. I have been asking everyone I can think about for the last 6 months about this (due to some breeding that is occurring at Shepherd’s Hey Farm) and Judith MacKenzie said that white is not the dominant color for sheep, as well. It’s because of this below. 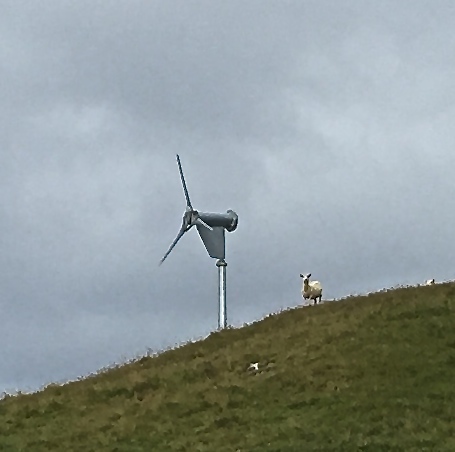 But…again, that is CLEARLY not a Shetland sheep and clearly not on Shetland. See? 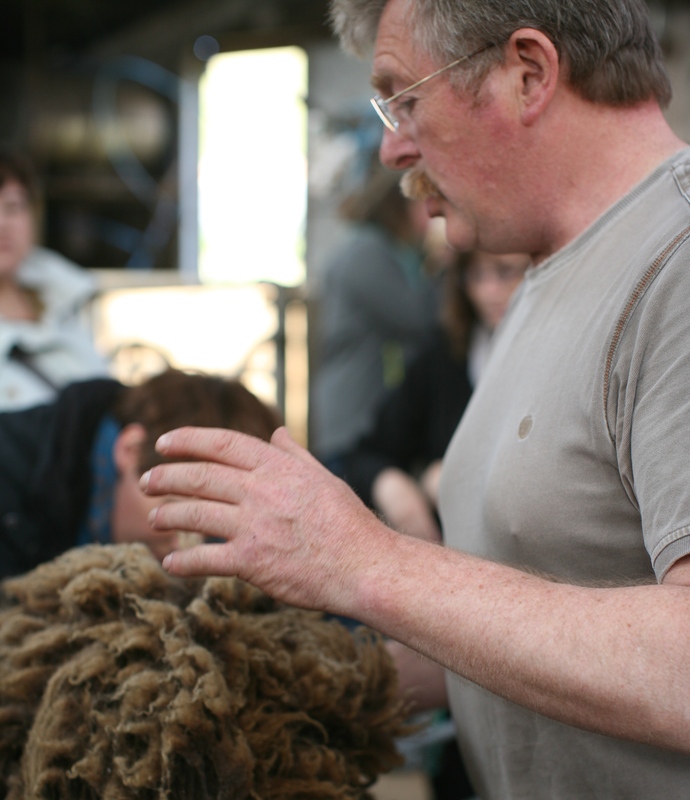 He’s showing us what is not desirable in yarn for handknitting (guard hair/kemp!) but perfectly fine for other uses. And Ronnie Eunson of Uradale Farm. 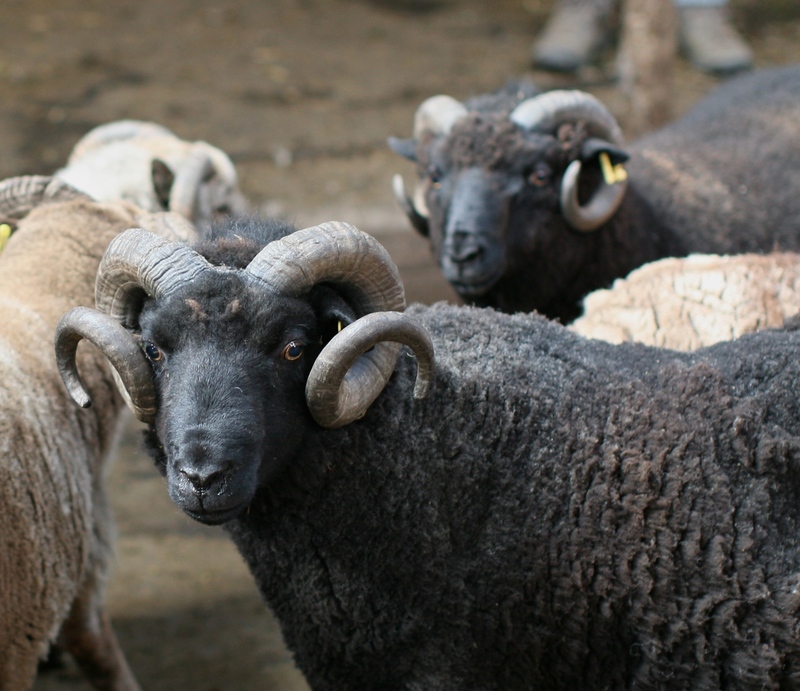 When we visited Uradale, Ronnie had rounded up some beautiful natural colored Shetland sheep (mostly rams but there was at least one girl in there!) from his flock. 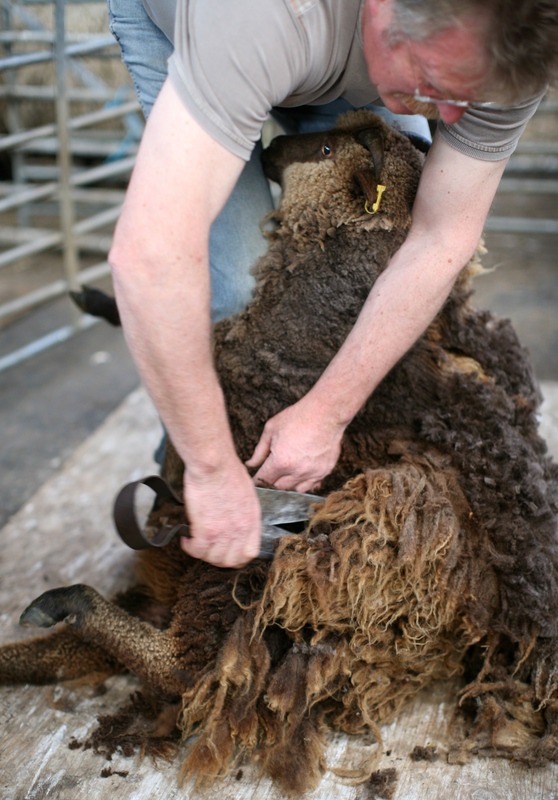 So he can hand shear a couple for us. I know what you are thinking. How could I be in presence of so many sheep and not even talk about yarn? Stay tuned!! One of my friends said, “I didn’t know there are pilgrimages in World of Yarn (WoY)”. 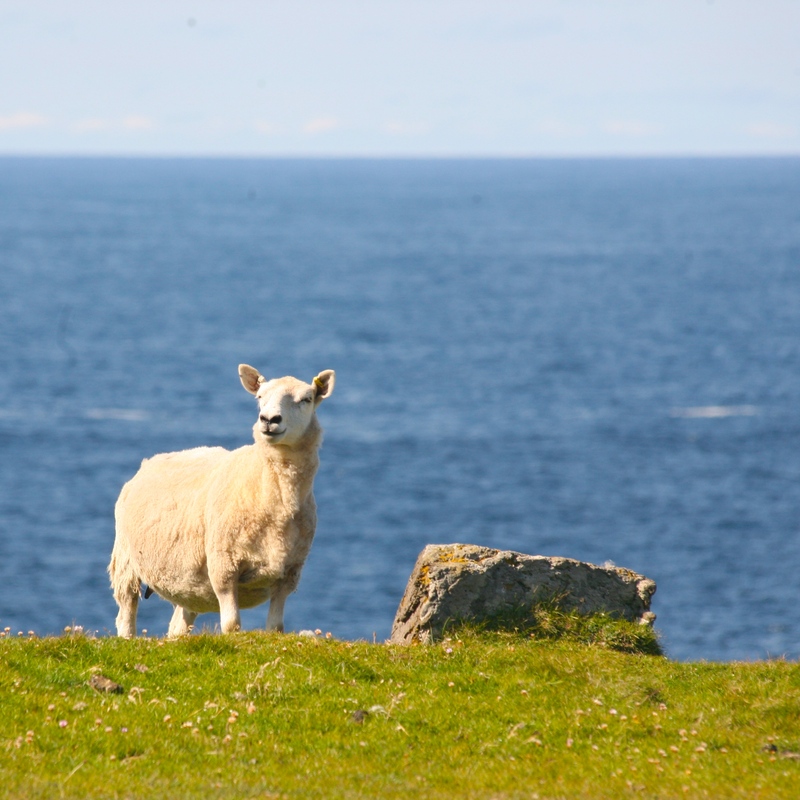 But, I would have to say Shetland, with its strong tradition in fair isle sweaters, lace shawls and the sheep, has to rank as one of the top 10 “WoY” pilgrimage destinations. I have wanted to go to the Shetland Islands for a very long time. And, I am lucky enough to say that I have just returned from a marvelous trip. Knitting designers/gurus Gudrun Johnston and Mary Jane Mucklestone started running these fiber-centric tours to Shetland last summer. The moment the notice for this year’s trip was mailed out, I had my deposit down and flights purchased. and the current craft industry as it stands today. We were based at the gorgeous Burrastow House, in Walls, where we were spoiled by Pierre’s fabulous cooking. We saw a lot, crafted a lot, and had a grand time. 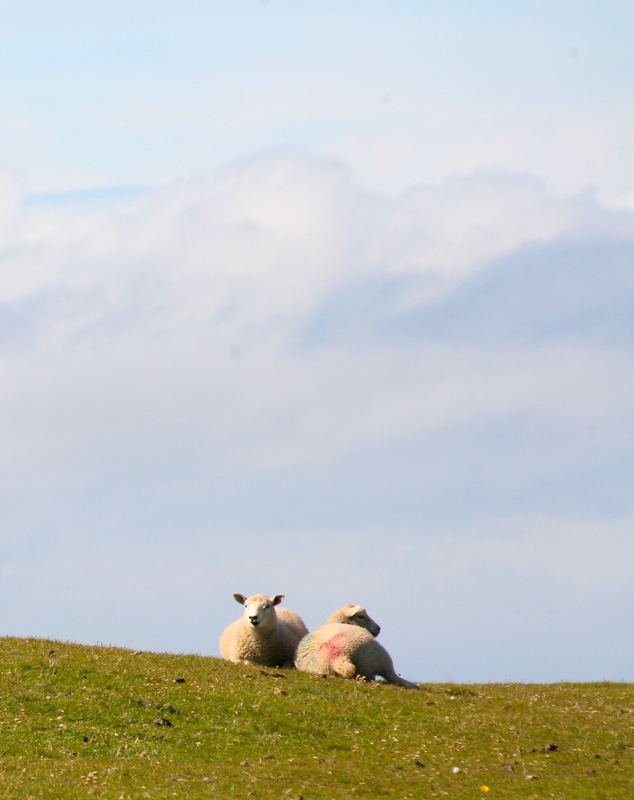 More about the sheep we met during out Shetland adventure next time. Sometimes, a new design comes out and it does not matter that I have a million projects on the needles, or looming deadlines. The perfect yarn is in stash, the needles are free (or I will free them). It needs to be cast on. This happens to me about once a year. It usually wreaks havoc in my well planned and organized knitting life. And generally, I really know I have no business casting on this new project. This happened to me when Wool People 5 came out. Curse you Jared Flood. Many gorgeous designs, as usual, and accessories heavy. And in the middle of all the shawls, one spoke to me. 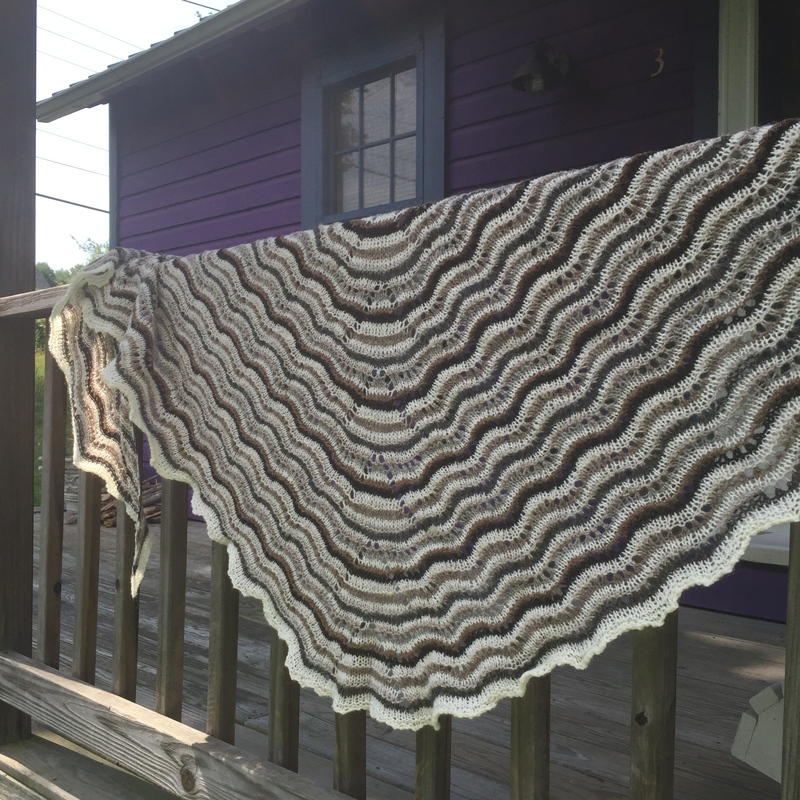 It wasn’t the runaway most popular shawl of the collection on Ravelry, but to me, it was perfection. 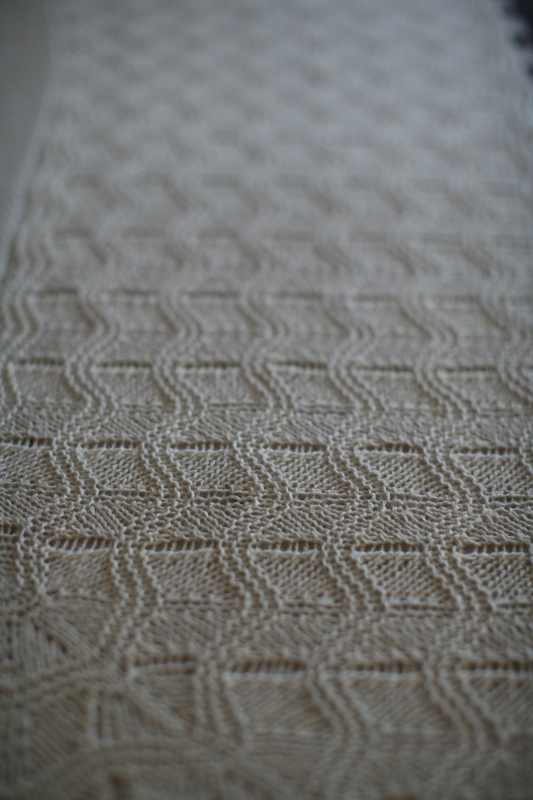 I had been Golluming my Malabrigo Finito in natural for the perfect, cozy shawl. It started screaming at me from its nesting place. Because the yarn totally knew it needed to be made into this shawl. 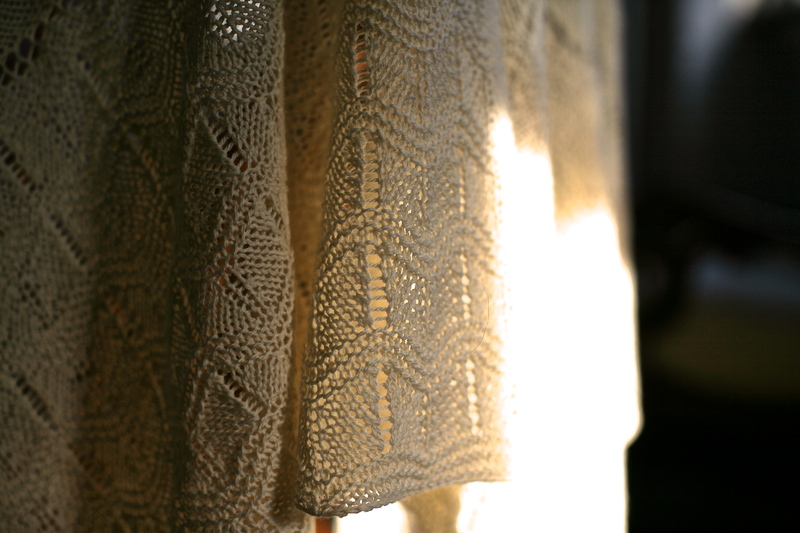 Not difficult, not lacy, not a project that can only be knit by a maestro. But knit in a cream, round yarn, there was no fudging in knitting this thing. 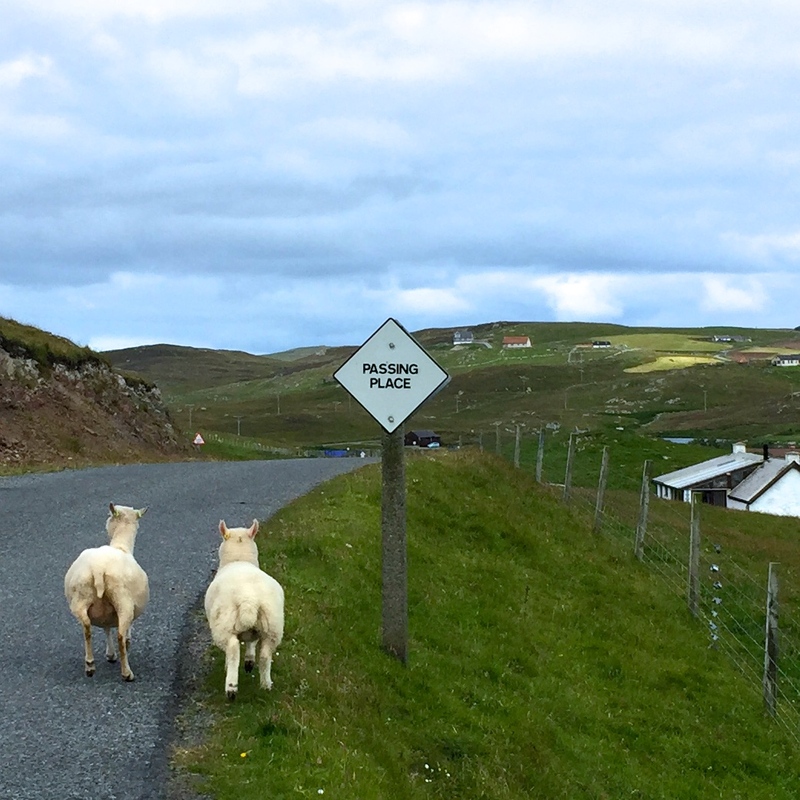 The construction is classic Shetland. The wave pattern in the edging had to be blocked out evenly. It appealed to the OCD part of me. I love the waves, but I also sigh in content as I look at the transition point from the triangular body to the edging. It’s so pretty. Sometimes, you just have to do it. You know the feeling, right? What!? 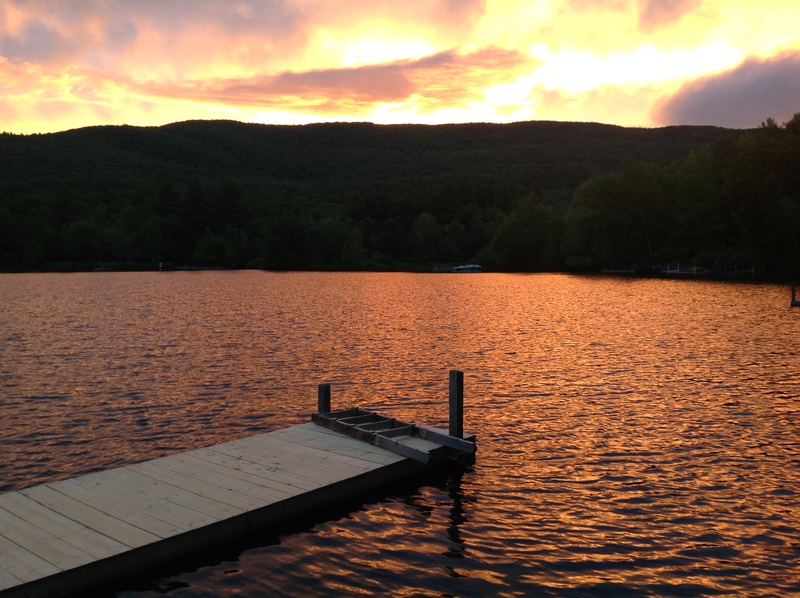 No, I did not take a sleeve workshop at Squam Art Workshops. 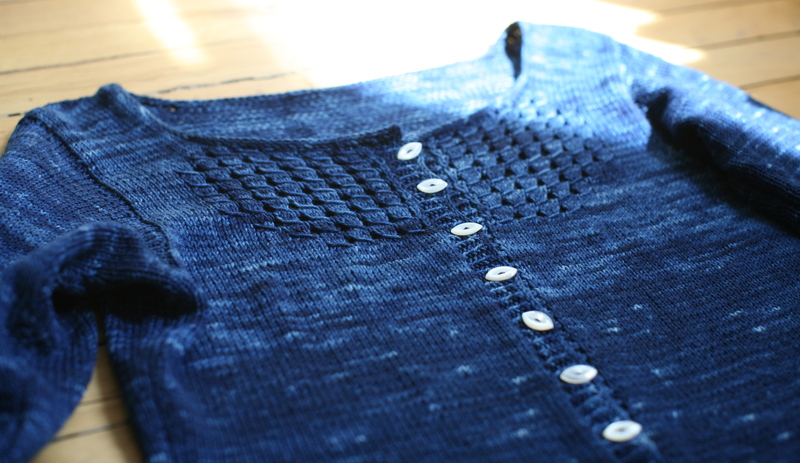 But, I did finish the sleeves for my June’s Favorite Cardigan while attending the Squam Art Workshops and cast on for the body. Couple of observations about my sleeves…. 1. Perhaps I should have alternated skeins. 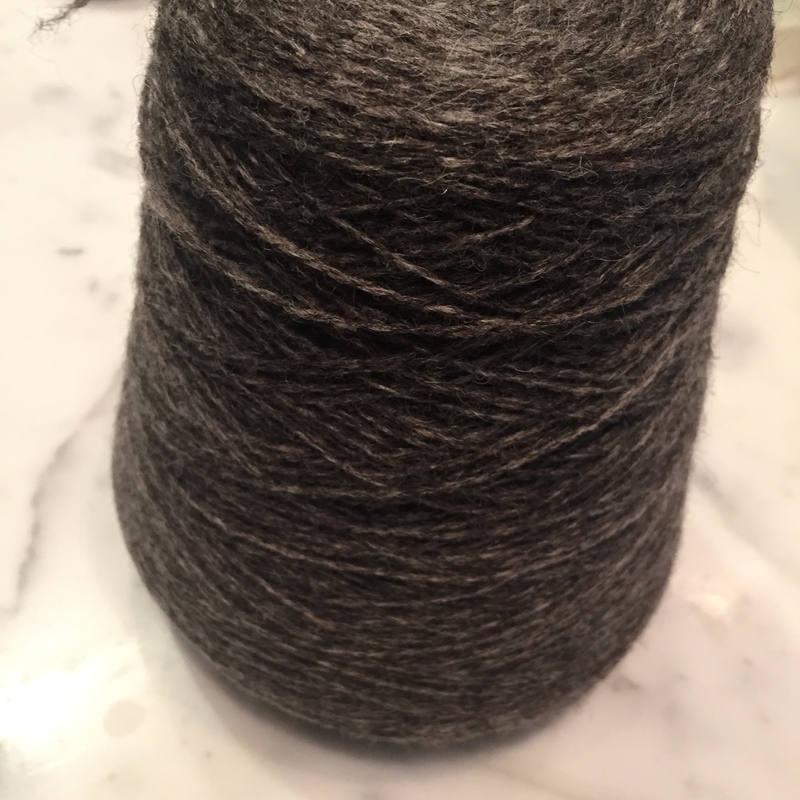 Each skein is different on this yarn, sort of like handspun that was randomly plied. If I were being a perfectionist, I would have alternated the skeins. 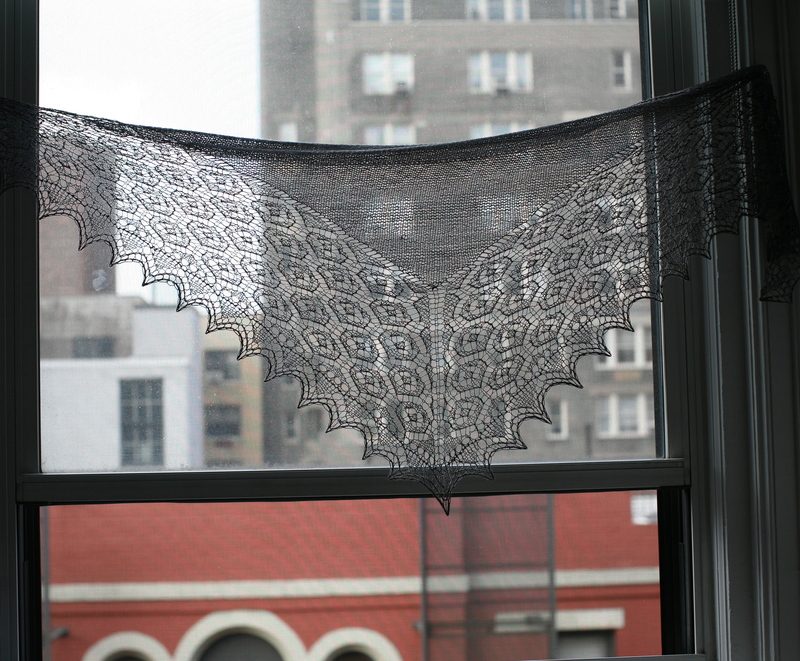 You can see from the enhanced photo that the skein changes are pretty obvious. From a normal distance away though? Good enough for government work. Which is a perfect segway for two topics: Stephen West and alternating skeins. I took a class from Stephen West (highly recommended, for many useful tips but also for the high entertainment factor). 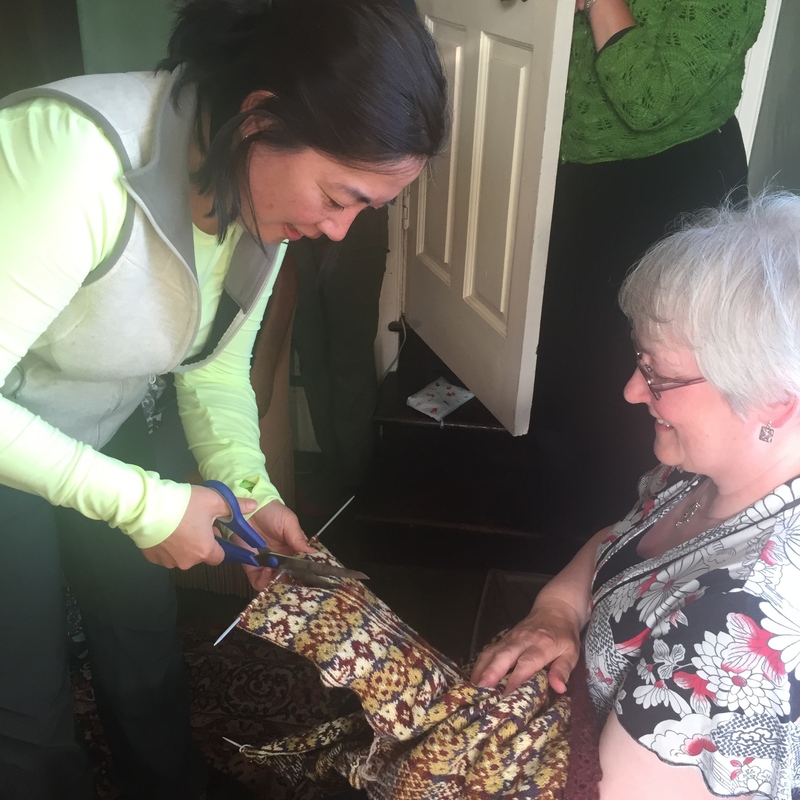 One of the best quotes (paraphrased): “If someone notices a knitting mistake on a garment and they see it, they are WAY TOO CLOSE. Take 3 steps back.” LOL. Two take aways from the class. I learned a ridiculously amazing cast on for garter which involve a bit of a pirouette of the wrists, and his shawls are beautiful in person. And yes, I’ve already been mentally rifling through the yarn that I have on hand to pirouette cast on one of his shawls. Stay tuned! Alternating skeins. 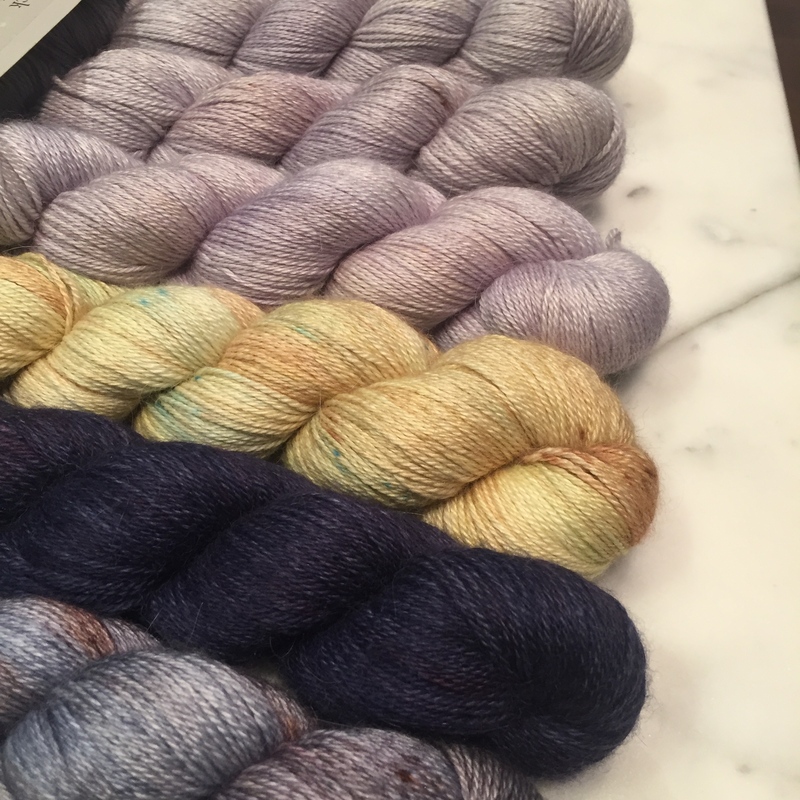 I would say that I alternate skeins, while using hand dyed yarn, 90% of the time. If I enhance the photo with high contrast (see left), you can definitely see that there is a major demarkation where I changed skeins. If I wanted to avoid this, I would have started alternating skeins…maybe not for the entire sleeve but at least for the last 4″ or so leading up to the switch. You can probably see that I’ve already made a modification on the sleeve….I twisted the cables in different directions rather than keeping them twisted in the same direction, so that they both twist into the body. I’ve cast on for the body, and am knitting along. There was a question as to what “knit as established” means — for me, that means keep the knitted fabric/pattern going as it was set up: So, stockinette is stockinette, and pattern stitches are pattern stitches. I think I’m going to take a day in the middle of the week and post progress photos from other participants. 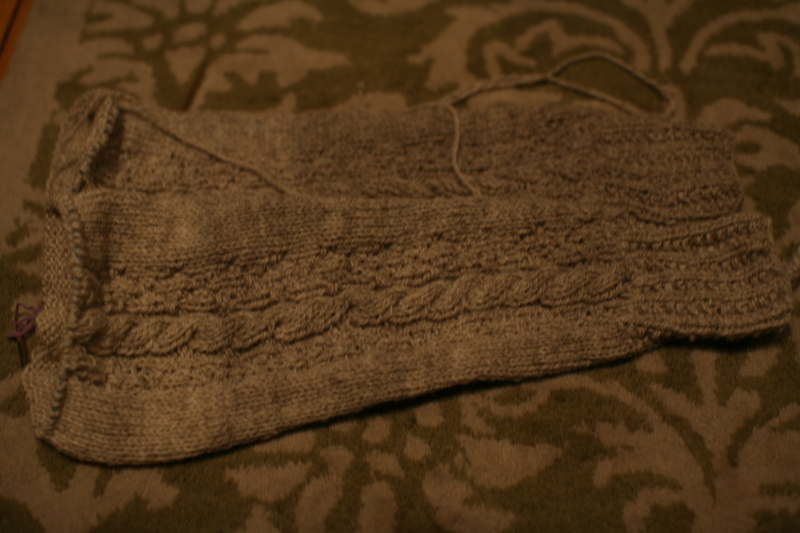 i am loving how this sweater is knitting up in the other yarns. 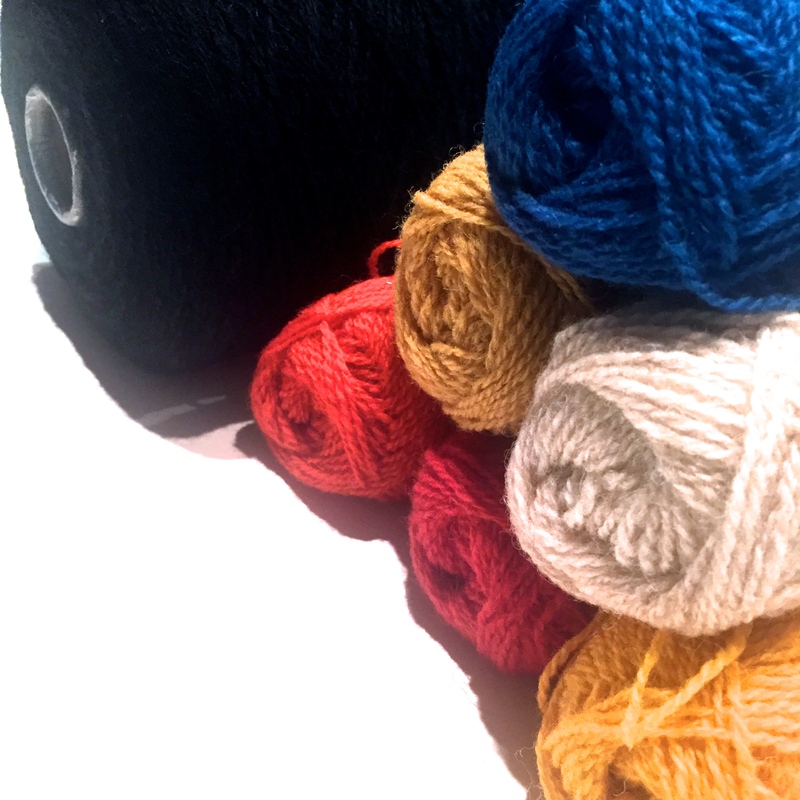 If I were to select a different yarn, I would definitely pick a very light colored, round yarn. Most people who know me know to expect this from me, the day after my birthday. In fact, I have gotten in the habit of taunting my friend Marianne about the day after my birthday (and a couple of other days in the year, but I know this is the one that “gets” her every time), to get the tissues ready. It was the day after my birthday. I bought a car, I bought a crate, and I drove down to Maryland to pick up my dog. This is the ninth year I will be telling this story. It starts this way, every year. Some details get added, some are omitted, and every year I am gladder that I get to tell the story again. It almost doesn’t matter any more why I decided that I wanted a border collie to begin with. 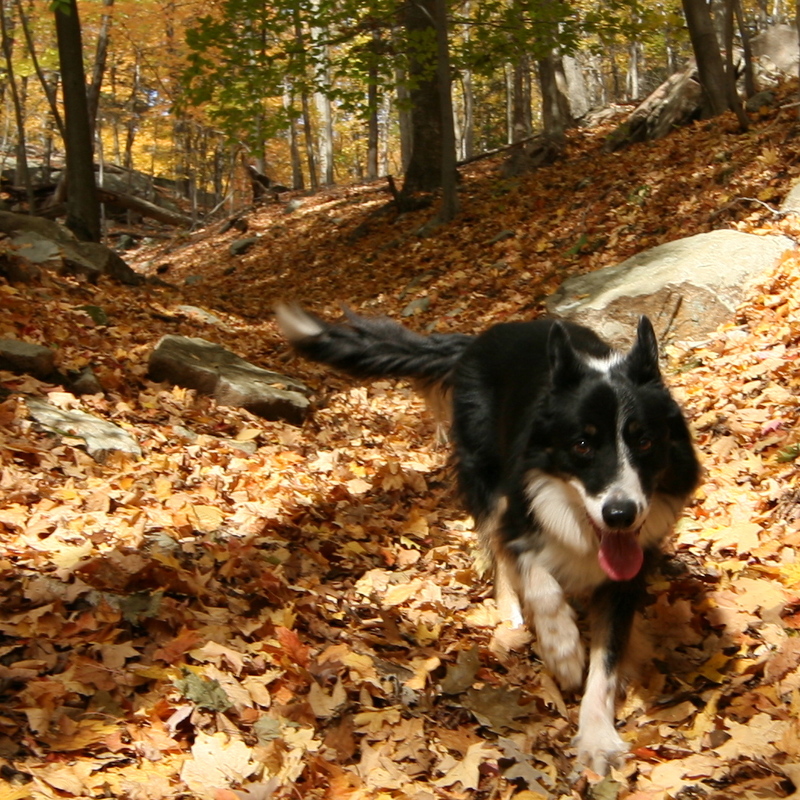 What really matters is that rescue after rescue told me that I COULD NOT have a border collie, not in New York City. Never mind that I was trying to adopt my first dog ever. I knew (I did, right?) an adult border collie was going to be “difficult”. But how dare they deny ME providing a home for an unwanted dog!?!? Those were the magic words. “You cannot”. 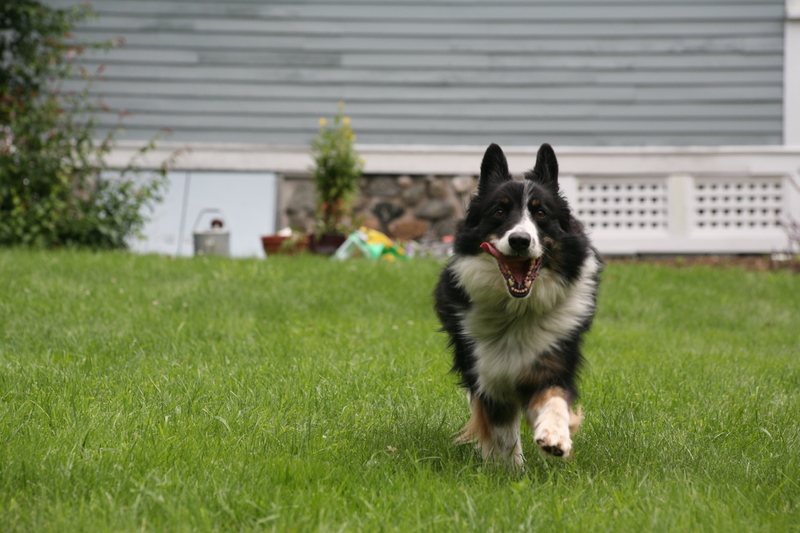 I did finally convince someone to let me adopt a 4 year old male border collie though, nine years ago. People tell me that Finn is lucky to have found me. I think he was totally meant to be mine. He knew that he found his sucker when he saw me. Played aloof a little, then gave me a big stare, then his goofy smile. I will never forget the first day I got him to NYC. He was so scared he was practically crawling on the street as I tried to walk him from my garage to my apartment. Automatic doors opened and he jumped. I thought he would never go to the bathroom on concrete. Thank goodness he’s the kind of dog that would sell his soul for food because he had never seen stairs before and back then, I lived on the 4th floor of a walk up. I coaxed him up, with food, inching up the stairs. It took me 45 minutes. Then, he turned into a total stalker. Of me. He stared and stared and stared. I lost 5 pounds in the first weekend that I had him because I could not eat while he was staring at me. “Dogs need exercise”, they tell you. So I ran and ran. I should have publicized it as the new diet. “The Border Collie Diet”. He has taught me many things. In the last nine years, I have taken many adventures because of him. 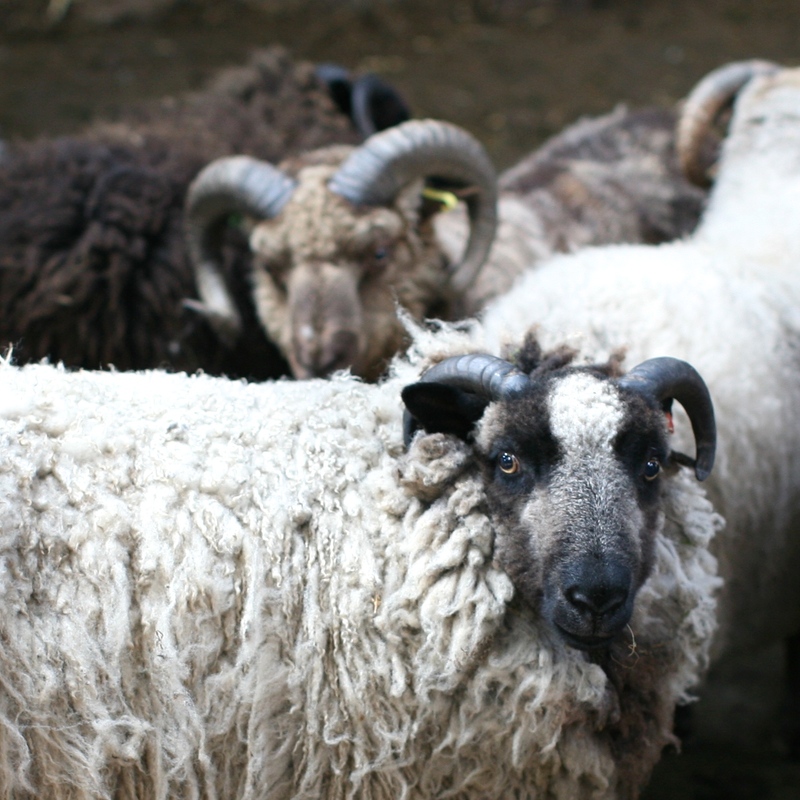 I have touched sheep (a lot, and not just because they are yarn about to happen). 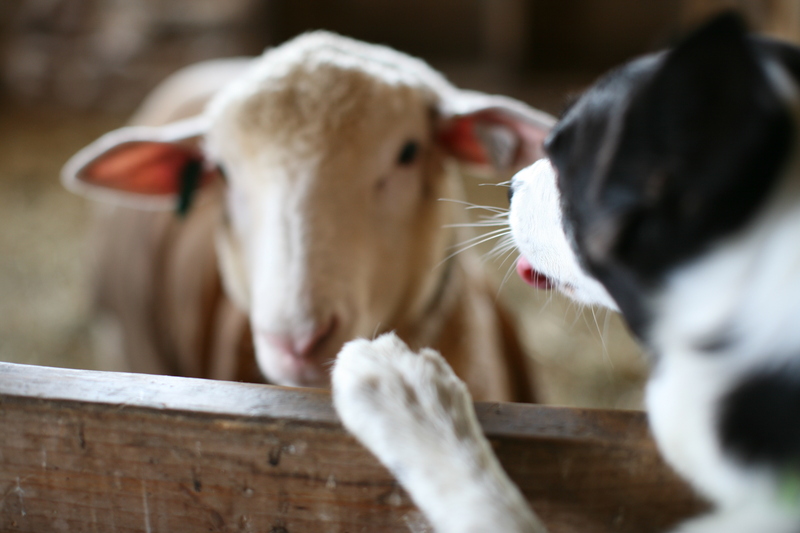 I have learned that communicating with another species is a different kind of challenge — dogs are so….literal. I have learned about canine structure and behavior. Most of all, I have learned what true companionship is all about. I don’t believe that dogs give you unconditional love….until you earn it. Once you earn it, though, then I think you become the sun, moon and goddess of their universe. Really, I don’t think I can do much wrong in Finn’s eyes at this point. In fact, as I write this, all 50 pounds of Finn are lying on my feet. And snoring. Because he’s an old guy. He’s a very good boy. I hope, with all my heart, that I get to write my day after my birthday story for several years more. Marianne, please pass the tissue. Happy adopt-a-versary, Finn. Thank you for a great nine years!